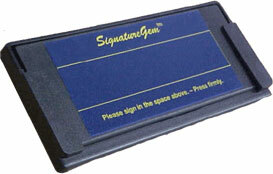 KioskGem 1x5 is a ruggedized electronic signature pad for use in public-access or unsupervised kiosk environments. The signature tablet bolts to a housing with no exposed fasteners and the pen is tethered with a steel cable rated at 470lbs. Kiosk SigGem, 1X5, USB interface. Non-Cancelable/Non-Returnable. KIOSK GEM 1X5 SERIAL I/F. Non-Cancelable/Non-Returnable. Kiosk SigGem, 1X5, USB interface.